This is one of several pictures I took of several famous or interesting locations in New York City a few years ago. I thought it was interesting because it commemorates a famous person who passed away. I invite you to take a visit to this site. The artwork is very interesting. Duke Ellington, as he was often called, was a famous African-American composer, jazz pianist and orchestra leader. 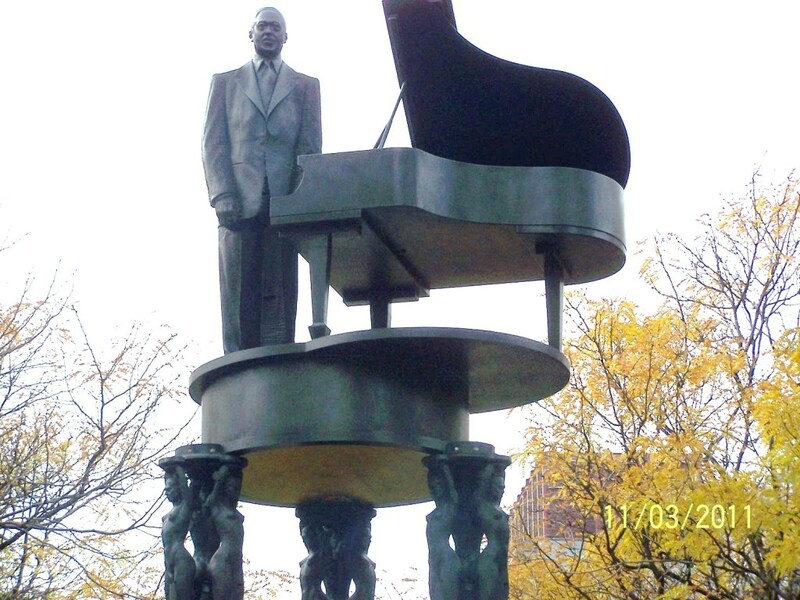 This sculpture, designed by Robert Graham sits at the circle by 110th Street and Fifth Avenue. The dedication of this sculpture took place in 1997. The location is between Harlem and Central Park. A few famous songs by Duke Ellington include: “It Don’t Mean a Thing”, “Take the A Train,” and “Mood Indigo”. This entry was posted in Uncategorized on November 30, 2014 by Elizabeth P.
This photo was captured in Squibb Park Northwest of New York City College of Technology on Middagh St. between Columbia Heights & Furman St. 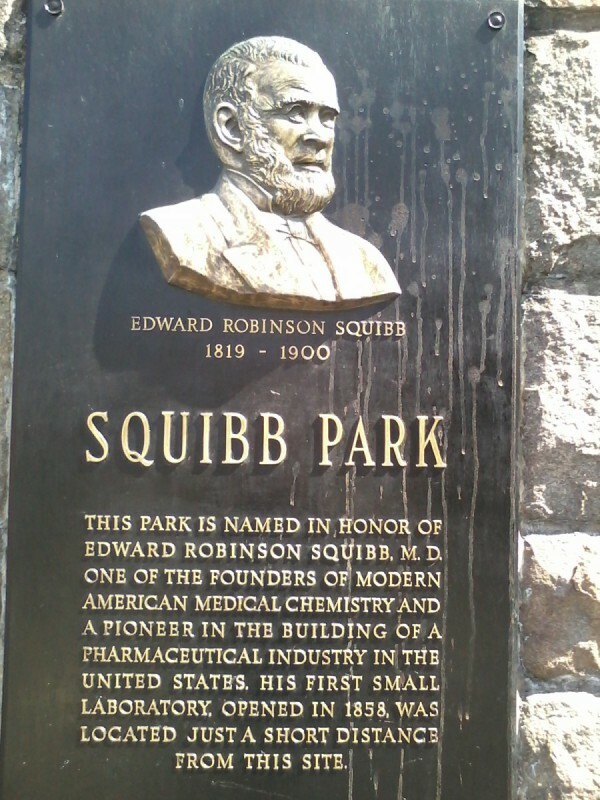 In recognition of Dr. Edward Robinson Squibb this park was built to honor his achievements in the pharmaceuticals industry. Its magnificent views of Lower Manhattan, the Hudson River, and bungee cord bridge attracts tourists and locals alike. There is a peaceful harmony about Squibb Park that sets my mind at ease, particularly the garden and the serenity of the trees. This entry was posted in Uncategorized on November 30, 2014 by Naquan26. This photo was captured inside the African Burial Ground Museum located at 290 Broadway, New York, it depicts a women and child attending the funereal service of a decedent. 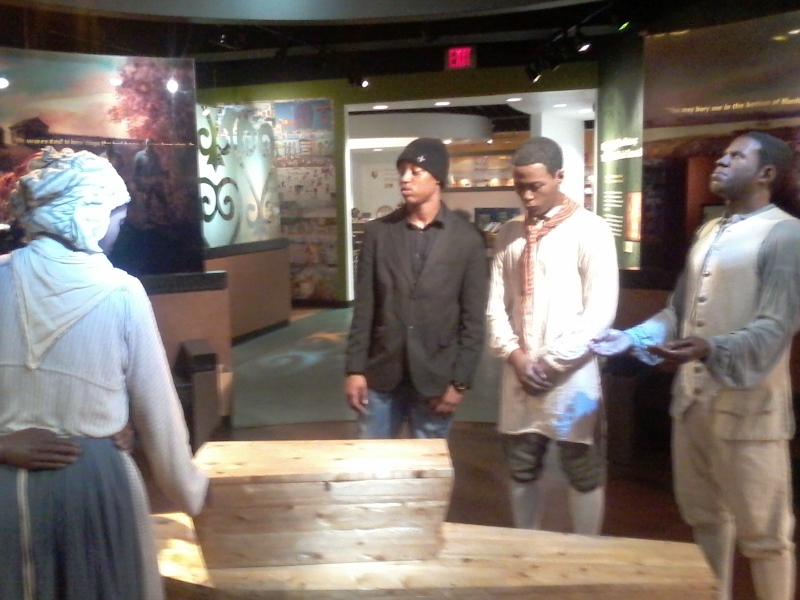 The museum uses sculptures to illustrate how a burial would look back in the 18th-century. 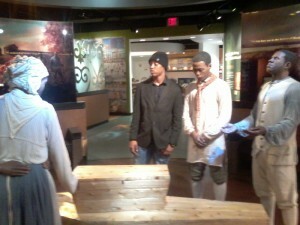 Visiting this museum was a tremendous experience which provided a lot of insight about my history. In 1991 the United States General Service Administration (GSA) purchased a plot of land with the intentions for construction of a 34-story office building located in Lower Manhattan adjacent to the Ted Weiss Federal Building. Historical maps indicated this site may have been an 18th-century African Burial ground. Prior to GSA making this purchase archaeologist conducted an excavation of the land which led to the finding of roughly 400 African men, women, and children skeletal remains. After making this discovery an investigation concluded this was an actual grave site for free and enslaved Africans during the 17th and 18th centuries. For more information on this story click the link below the picture. 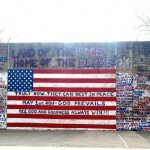 G-d Bless America Wall- 9-11 handball Court Wall (Left Side), Bill Brown Memorial Playground, Avenue X, Brooklyn, N.Y.
Commemorative 9-11 Handball Court Wall, Full View, Bill Brown Memorial Playground, Avenue X, Brooklyn, N.Y.
G-d Bless America Wall- 9-11 handball Court Wall (Left Side) Bill Brown Memorial Playground, Avenue X, Brooklyn, N.Y. 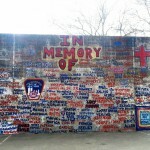 Located in Sheepshead Bay, Brooklyn, on Avenue X, is a popular playground where, on one side are swings and slides, off to the right you may have tennis (depending on time of year), and in front is a huge handball court wall painted in memory of the victims of 9/11. The memorial spans most of the concrete slab, which measures more than 77 feet long and 25 feet high; the flag in the center measures more than 22 feet wide and 11 feet tall. 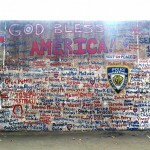 The wall features the names of more than 270 local Brooklynites who died in the Twin Towers. The mural/graffiti art was painted by south Brooklyn neighborhood icon, ‘Rockin’ Ray Fiore “without permission from the New York City authorities… in a marathon session from September 17 to September 23, 2001..”..he worked on it for “fourteen hours, six days straight.” Rockin’ Ray’s signature can be seen in the lower right hand corner of the wall. A memorial committee was set up, the Brooklyn-Bedford 9/11 Memorial Park Committee, which prints and distributes fliers and asks attendees to bring a candle- using this as an annual gathering spot to remember the fallen in a 2-hour ceremony that uniquely captures the spirit of South Brooklyn. Like Leonardo’s “Last Supper” – this paint needs some refreshing, so periodically, the artist, Ray Fiori, touches up the wall, retraces names that have faded off because of the elements and sometimes adds new names which he discovered were left off. On a misty, grey cold day in November, after Thanksgiving, it stands oddly alone. Only a few Parks Department workers were there cleaning up around the park. However, when Spring rolls around, the park and the ‘inner sanctum’ where the handball court’s wall stand, is so crowded that only the top of the mural is visible. Where: This photograph was taken in front of the Brooklyn Supreme Courthouse in Brooklyn. 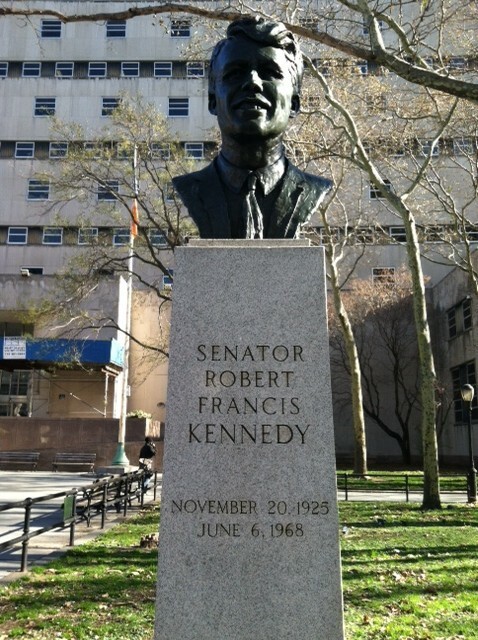 Why: Senator Robert Kennedy is being commemorated as a Senator of New York. He was also known as an avid fighter of corruption in organized labor. 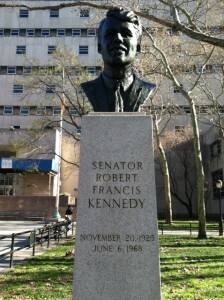 He was assassinated in 1968. I was happy to see this statue in his honor. Although he is gone, he will not be forgotten. Mexican tradition have many ways they honor the dead, one way is they celebrate day of the dead and in english it is referred to day of the innocents. on October 31st they celebrate children and on November 1st they celebrate adults. I took this picture at my best friend Karens house. 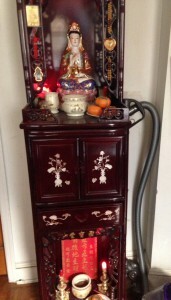 This is a similar alter table like the one I have in my house. Her grandfather recently passed away in Mexico over the summer and this is in memory of him. 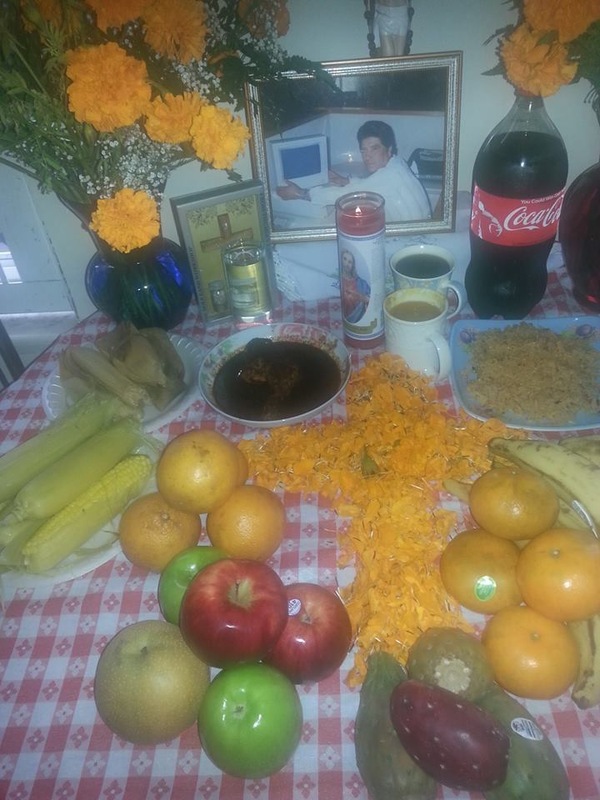 They set up a photo, candles and flowers and offered fruits, vegetables, tamales and a beverage in respects of his passing. I think it is great how different cultures have different traditions but are all similar and this is a beautiful way to remember my best friends grandfather. This entry was posted in Uncategorized on November 20, 2014 by Ivana Bartiromo. 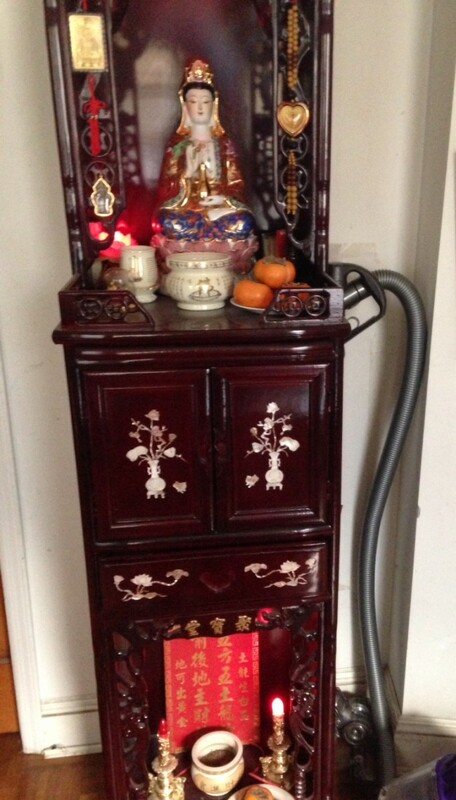 In my home we have a alter stand where my mom keeps her Buddha statue of Guan Yin. She is the East asian goddess of Mercy. My mom prays and lights an incense twice a day when she wakes up and before she goes to sleep. The bottom slef is dedicated to my grandfather from maylasia who passed away before I was born. Although I never met him I always feel like he been a part of me and present in my home. Every other day we offer different fruits to Guan Yin and my grandfather. After my mom prays the fruits are considered blessed. On special holidays like chinsese new year and the moon festival we leave different vegertarian dishes and desserts as an offering. The candels and plaqe with gold lettering are a symbol of my grandfather. I was raised catholic and received the three sacraments, baptism, communion and confirmation but I still go visit the buddhist temples in china town with my mom once a month. Having the alter in my home is a way for me to feel connected to my grandfather and receive his blessings. This entry was posted in Uncategorized on November 19, 2014 by Ivana Bartiromo. 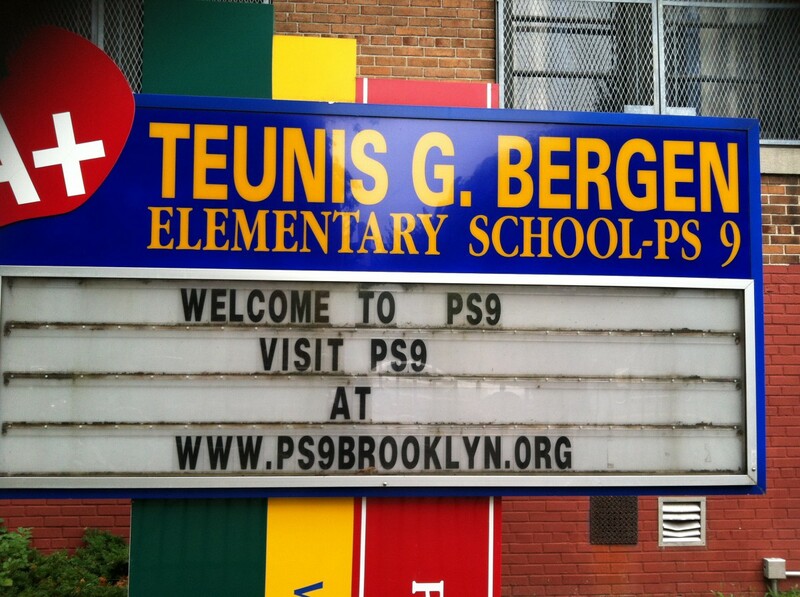 Why: Teunis Bergen, is being commemorated with a school and street name (Bergen Street, Brooklyn), because he was a U.S House of Representative member from 1865 -1867. He also served in the New York State Militia in the rank of Colonel. 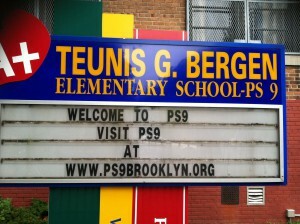 I used to live on Bergen Street as a child. I never knew that the street was actually a dedication to someone. I just happened to by walking by this school and noticed the sign. This is quite interesting to know. This entry was posted in Uncategorized on November 15, 2014 by stacey w.
Where: This tavern is located in lower Manhattan, on Broad Street and Pearl Street, NYC. Who: Samuel Fraunces was known as a restauranteur, inn keeper and perhaps more importantly, a close servant and advisor to George Washington, during the Revolutionary War. 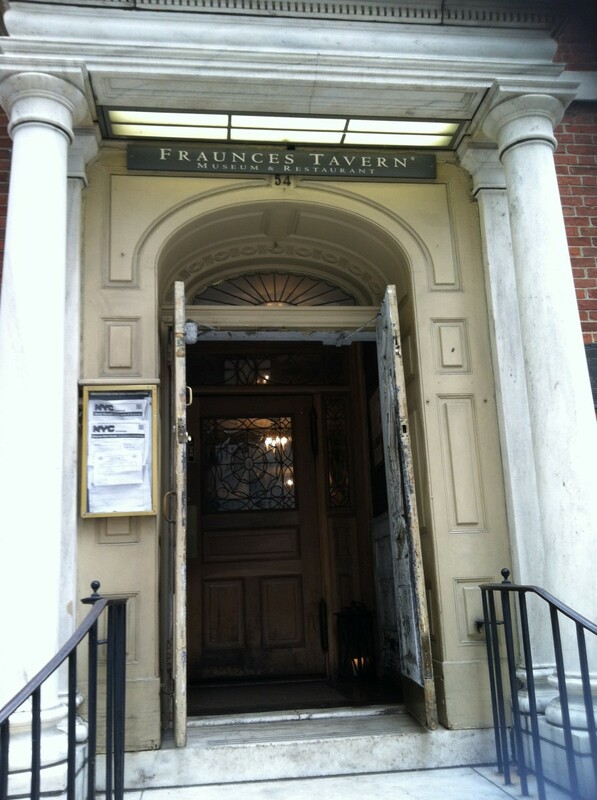 Why: This location was actually owned by Mr. Fraunces during the Revolutionary War. Also, this location was known as a regular meeting location for George Washington as well. The Tavern stands mostly as landmark to Revolutionary War and role Mr. Fraunces’ played. This location has a classic feel to it. I love the presence of history in one of the most modern cities in the world! WHERE: I took this photograph in Brooklyn, NY. 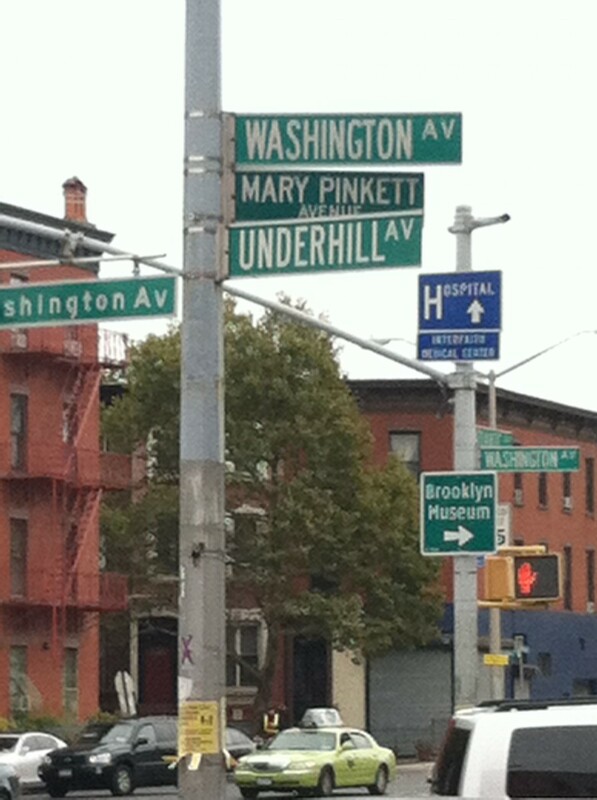 WHY: Mary Pinkett is being commemorated for her work and dedication to Brooklyn, as a labor advocate. She died in 2003 at the age of 72. As a native Brooklyn resident, I have travelled through this intersection many times. 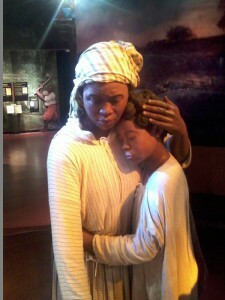 It is nice to see Ms. Pinkett being represented in such a way. She will always be remembered in this manner, being that the location of this sign is a heavily trafficked area.